With our DR PRO Edger you can take your yard care to the next level! Cut professional quality edges anywhere on your property—along sidewalks and driveways, around flower beds, even next to curbs. If you are ready to graduate from handheld edging tools–as well as the arm fatigue and wobbly edges they so often produce–the DR Lawn and Garden Edger is the tool for you. It features a 4-wheel platform that is much more stable than the more common 3-wheel models, and it's stacked with professional features! A curb hop wheel (rear right wheel) allows you to straddle a curb, with one wheel at street level, making it easy to track in a straight line and create precise cuts. For edging around flower beds, the cutting blade pivots 15 degrees in either direction so you can make attractive bevel cuts for containing mulch. You'll get a manicured look that will enhance your landscaping, and make your lawn care efforts shine! Forged of heat treated alloy steel, this 2-inch-wide, hardened blade means business. Don't settle for flimsy blades that may require multiple passes, or a string edger that may never cut through to the roots! Depth control is right at your fingertips, with fixed positions from .5" down to 3". In areas that haven't been edged before, start high and make a second pass at a deeper setting to cut into roots and minimize regrowth. An adjustable wheel allows the DR to straddle a curb, with one wheel at street level, and track with perfect stability to create clean, precise cuts. Now that's curb appeal! You can adjust the blade housing fifteen degrees in either direction, or keep it vertical, depending on the style of edge you prefer. Many pros opt for vertical edges along walks and drives, with angled cuts around flower beds or other areas where a less severe look is desired. Many wheeled edgers have only 3 wheels which can often create a wobbly ride...and that can show up in a wobbly edge. Handheld edgers are even worse. Professionals insist on 4 wheels for maximum stability. With Overhead Valve and plenty of power (8.1 FPT, 179cc), our DR engine has plenty of muscle for cutting edges, even in tough clay soil. Available with Manual- or Electric-Start. I currently have a fleet of older tru-cut edgers and was looking to start cycling out for something new and more worth the price. I came across the DR Pro and was skeptical at first with its commercial use claims running 6 hours a day but this thing blew my expectations out of the water. Our application is edging cart paths and T boxes on a golf course. So I needed something that could put up with a lot of load without slipping but also be able to cut deep enough to reach the kikuya roots running underneath the T boxes and it does just that.. at less than half the cost of a tru-cut. Build seems very durable But remains pretty light for what it is and the engine provides plenty of torque for anything we come across. I would recommend this machine to anyone with a light to medium duty work load. My only 2 complaints are the plastic wheels, and the back wheels do not have wheel scrapers to remove the clumping dirt. But those are all easy fixes. I plan to buy many more of these machines in the future. I have used the edger only to edge the sidewalks so far and it has worked very well. When the yard dries out a little, I will try edging the flower beds. I really didn't want to spend this amount of money for an edger. I'm not a professional lawn care or landscaper, but bought it with the discount offered on-line. I also, didn't want a belt driven machine, but soon found that no machines in the class had a direct drive. I decided to buy the DR and so far, don't regret it. It starts easily, has plenty of power and adjustment and is very stable. Assembly was easy. The only thing I noticed was that there were some scratches from shipping. Not enough to complain about, but for a 400.00 machine the packaging could be more secure. No issues with this one. Even trenched a line in my yard for landscape lighting! I haven't used it extensively yet as there was a long delay in delivery. Assembly was easy and straight forward. Engine starts on first or second pull. The wheel design makes it much more stable and easier to control. The only reason I didn't give it 5 stars is the limited time I have used it. First the not so good. The owners manual is for several motors which have different oil capacities. It also shows an on/off switch of which there is none. You let go of the handle and the motor shuts off. I would also use a three or four sided blade of which both will make better contact while in use. Now the good. The motor starts on the first pull every time. The pull is very easy and even a young 10-12 year child could start it. It has power galore. Even going down 3 inches on the first pass the motor never stalled or complained. I do not regret the purchase of this edger at all. Top quality and easy to use. Such can't be said of the Craftsman edger that it replaced. This edger starts right up and has plenty of power. It does a great job quickly. Good purchase.. Very good machine but needs Edge Guard too guide you down the curb. This machine is nothing but pure power it dig in and get the job done. I like the professional cut it makes. sharp. Makes a real good cut through grass and dirt. Easy to maneuver. I searched for weeks comparing this edger to that edger at all of the big box stores. I found myself browsing the Internet and I looked on the DR website. Considering my dad and brother had purchased other products from them and were happy, I decided to as well I am very glad I did. I paid a little more for this product, but is worth every penny so far. The motor runs super smooth and never bogged down at all!! I would recommend this product to everyone from what I’ve seen so far. This machine is truly a great product. It has the power to go through thick grasses and packed or compressed dirt and shale to edge even the toughest yard. 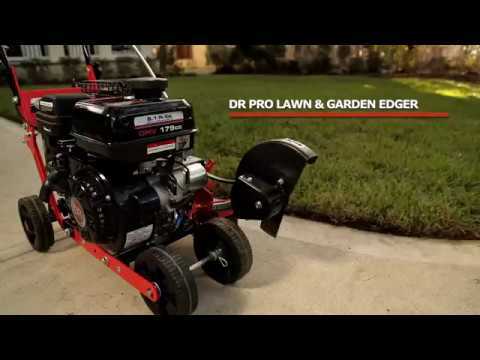 I am highly impressed, and am extremely glad I purchased the DR PRO Lawn & Garden Edger. I will be looking to purchase other products in their lineup in the future. Had it out of the box and assembled in less than 15 minutes. Added oil and gas, set the choke and started on the first pull. Edged around one our hedges, about 100 feet, and it worked like a charm. Looking forward to doing the rest of the yard. Something I thought I’d never say. only reason for not giving it 5 stars is I haven’t used it long enough. it works as advertised, except i'm old school and it took me a minute to figure out that the choke must be on for it to start, not only when cold but even after it has been running. I called dr and they told me that's how these new engines are. other than that it has been as advertised. The edger makes it easier for me to edge sidewalks. I like the four cycle motor and its power. The price was competitive. The edger does not do as good a job as the string trimmer that I have been using. It is more difficult to get close to the sidewalk and more difficult to aim. It is difficult to use on curved portions of sidewalks. Due to my advancing age, it it was a move I needed to make. If there is a better EDGER to be had, I haven't seen it yet. I have 3 edgers besides the DR Electric Start that I recently purchased and there is no comparison. Seems like a sturdy and powerful piece of equipment. Does a wonderful job and I just hope it holds up well. the edger works well w/ manual start. Shipped with a battery. Got one start out of it. Tried to charge, charger showed green light after 8 hrs, but would not start. Would only start w/ the key if I had the charger set to the start position. New battery is being shipped, and if it's a good battery I'll be very happy. Delivered to my rural home. Easy to assemble. Basic heavy duty product with regular not automatic choked engine. Time will tell on how it holds up, but very satisfied initially. Very powerful machine,well built, Impressive Lawn Edger that meets all my needs. The elevation wheel works excellent trimming roadside curb grass. I could not be happier. My edger arrived promptly after ordering online. After five minutes to unpack, attach the handle, add oil and gas, I was ready to go. It started easily pull start model and I edging. This model replaced a 15 year old Craftsmen edger. The DR Pro Edger is better built, more powerful and does a far better job. I am very pleased with my first purchase from DR and look forward to many years of great results with this edger. I really like this unit and it performs the edging well. I give it 4 stars based on after purchase service and parts. After spending the extra 100 to get the electric start, the starter switch assembly fell apart and pieces were lost within the first hour of using. I contacted DRPower and a replacement was sent. However it is an aftermarket cheap, bare bones switch and nothing like the nice plastic encased switch and key holder that came with the unit. I tried in vain to get the original, but after the customer agent talked to her supervisor/manager, I was informed that this is an aftermarket replacement piece and since they are a 3rd party seller they could not get the original. Needless to say, very disappointed....definitely not what I expected when purchasing this unit from DRPower. The product seems solid/well built in general and works as indicated, the customer support, parts supply is not acceptable. I just received the new edger. I am an owner of several DR Power products, including the 30 20hp field and brush cutter and a chipper/shredder. Like the DR products I have, the unit seems to be very well built with quality materials. Initial setup was easy, and the unit performed well. Here are the reasons I gave 4 stars rather than 5: The starter assembly beneath the key fell apart within the first 20 minutes of using the machine. Parts were lost on the ground. I contacted Technical/parts support and they will send a replacement starter assembly. Told me I could get 10 discount on a maintenance kit. I asked about a replacement blade and belt. Can't get the 10 discount on that, only the kit. Oh, by the way, there isn't a maintenance kit available yet for this unit Maybe picky points, but expect a bit more when buying a 499 product and being a repeat customer. This machine is solidly built, with four wheels and a low center of gravity. It's easy to use and does exactly what you need it to do. In just a few minutes, it will dramatically increase the useable width of your sidewalks and clean up the edges around your gardens. This Edger is a welcome addition to a homeowners tool shed. This is a powerful little machine. The DR Lawn Edger is more than capable of blasting through the ground around sidewalks and curbs. Making it an effortless job to keep your yard looking good! This machine creates a nice, clean, straight edge that gives anyone's garden that professional touch! It's easy to use and makes quick work of any job. Q.Where is the engine for the edger made? A.Thank you for your interest in the DR Walk-Behind Lawn Edger. The overhead valve engine for the DR Edger is produced in China to DR Power's specifications, chosen specifically for use with the Edger application. All DR products are put through rigorous testing protocol to ensure the highest level of quality before being released for sale. DR Edger models are available in Manual and Electric Start. Please feel free to contact us if you have any other questions. Q.How does the curb hop feature work? A.The curb hop feature allows three of the four wheels to ride up on the curb while the fourth wheel drops lower to ride along the pavement or sidewalk. Simply loosen the knob on the curb hop leg and allow it to fall to the ground. With the machine level, tighten the knob to hold the curb hop leg in place. The machine should be off while this adjustment is made. Q.Are the wheels a hard plastic as opposed to a rubber wheel? A.Thank you for contacting us. The wheels on the DR Walk-Behind Edger are a hard plastic, making it easy to use on all terrains. Please feel free to contact us if you have any other questions. Q.How do I replace the edger blade? A.Thank you for your question regarding the Walk-Behind Edger. There will be two tools required for replacing the edger blade, a #2 screwdriver and an 18mm wrench. You will align the holes in the spindle shaft and bearing housing then insert the screwdriver through these holes. Using the wrench, remove the blade nut. Lastly, replace the blade, make sure the compression washers are replaced in the correct configuration (they are what hold the blade secure), and ensure the blade nut is well torqued. We also offer Tech support both online and over the phone. Please feel free to contact us if you have any questions. Q.How do I adjust the depth of cut? A.Thank you for your question. To adjust the depth of cut you will simply move the blade depth handle until the detent pin engages with the hole for the desired depth of cut. This adjustment can be done while the machine is running with the operator safely in the operator zone behind the machine. Please feel free to contact us if you have any other questions. Q.Can the wheels be upgraded to rubber-tread ball bearing steel units? A.Thank you for contacting us. The DR Pro Lawn and Garden Edger does not have a wheel upgrade kit. Many wheels were tested when designing this unit, we found that the four-wheel design using these wheels was the best. Please feel free to contact us if you have any other questions. Q.How do I adjust the blade angle? A.Thank you for your interest in the DR Walk-Behind Lawn Edger. Adjusting the blade angle is incredibly easy. All you have to do is place the blade angle handle in the desired position and you're good to go! It is important that the machine is off while this adjustment is made as the operator is required to leave the operator zone. Please feel free to contact us if you have any other questions. Q.If the electric start fails, is there a manual override? A.Thank you for your interest in the DR Walk-Behind Lawn Edger. There is a manual back up on the electric start engine. Please feel free to give us a call if you have any other questions.